Nelkin Designs Blog: A Giant Pink Hug for us All! A Giant Pink Hug for us All! It is time for a year end blog post... in past years I have done a recap of all my projects, but I'm worried if I do that this year you'll all just see me for the over achiever I really am. So this year I'm sharing something a bit different. One of the things I love about my chosen profession is that is a place for all souls to come and take a break from politics, religion, hardship and focus on our passion for creativity together. It means I get to meet a lot of people who think like I do, and also many who do not, but we find out common ground and build friendships from there. For me, it was a good year, and I'm looking forward to another, but for others I know that this year was HARD and that the years ahead are scary. My heart goes out to them, whether they be close by to me, or half-way around the world. My family and I are giving support in ways that resonate for us, and I urge you and yours to do the same.... and in that spirit I have a little story to share with you! This fall, Anzula sent me their new bulky MCN yarn, Burly, in Petals to knit a giant ALL-Ways Cowl. 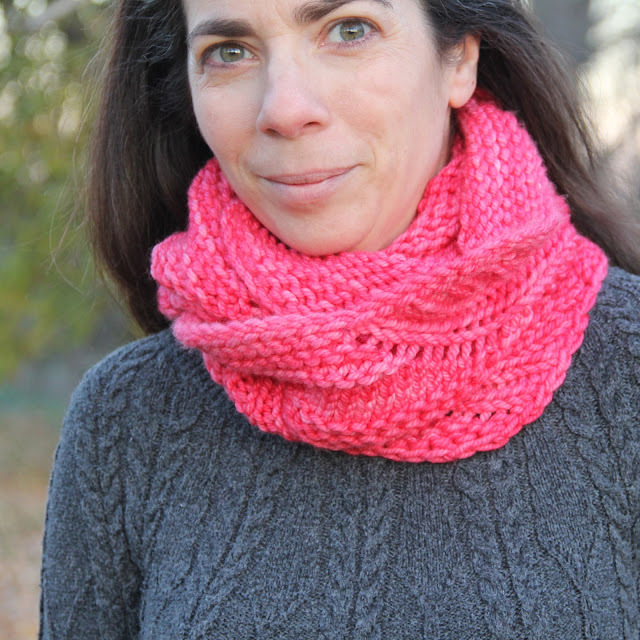 The day following the election I was in shock (I know I'm not the only one who experienced this), and decided to deal with it by casting on the cowl and knitting until I felt a little stronger and more in control. I thought about how far down in the sand my head was (politically), and how little I understood what many people in our country were thinking, and I knit. 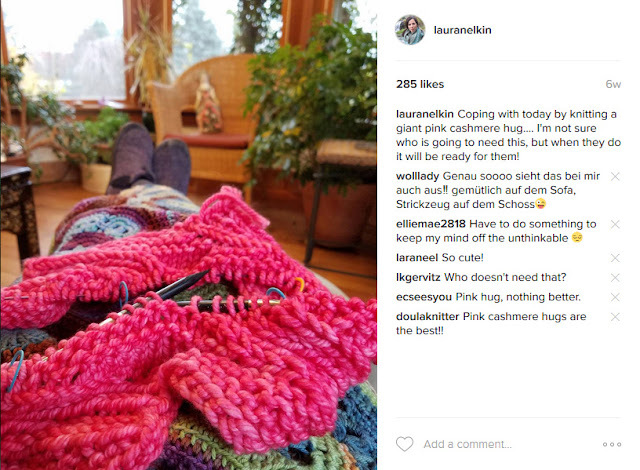 True yarn therapy.... while I knit on it I realized I wanted to share it with other people, in fact as many as possible, something like the Sisterhood of the Giant Pink Cashmere Hug. I started wearing it when I traveled, convinced that I would see someone who needed it and I would pass it on... 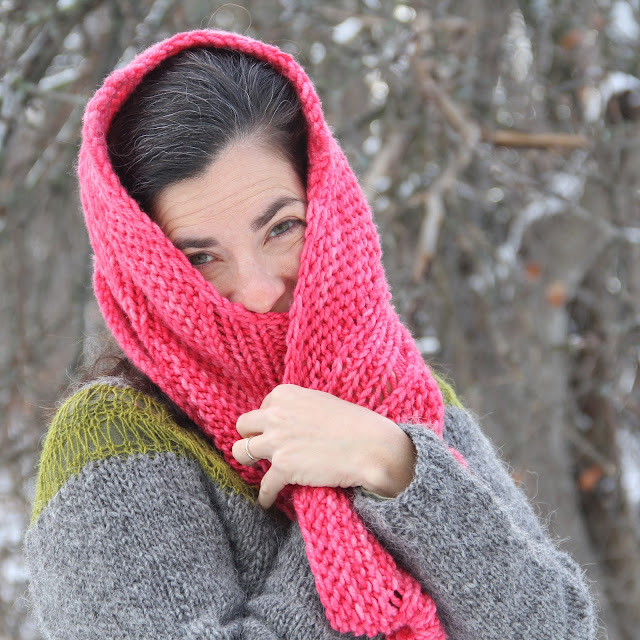 I had it with me on multiple trips and somehow just couldn't give it up (or face the awkwardness of giving a complete stranger a pink cowl...) . Where ever I wore it the color would make people around me smile, and as a result I was smiling. This pink demands happiness.... and happiness it will have! Also, cashmere is a good travel companion. But, now it is time to send it on it's mission around the world. I'm going to start by sending this to Sabrina, the genius who created this gorgeous yarn! I'm hoping she'll wear it, find joy in it, take a photo of herself (and hashtag it #giantpinkhug), and then pass it on to another in need of a hug! I LOVE this idea of this traveling hug, and I hope you do too! Lovely idea. There will be many as always who need a hug giant pink or not. xoxoxo, Happy New Year to you!!! Ah, you just verbalized my intention... thankyou darling!!! Happy New Year! I'll ask her when we talk next week... you can also get a store that carries their yarn to order 2 skeins for you, that is all you need! And thankyou La'Ketta! You are loved!!! Huge Hugs! A wonderful idea; you rock, Laura! Knitting is one of many kindnesses that are sorely missing in much of today's world; we CAN make a difference. Safe travels!! Laura. 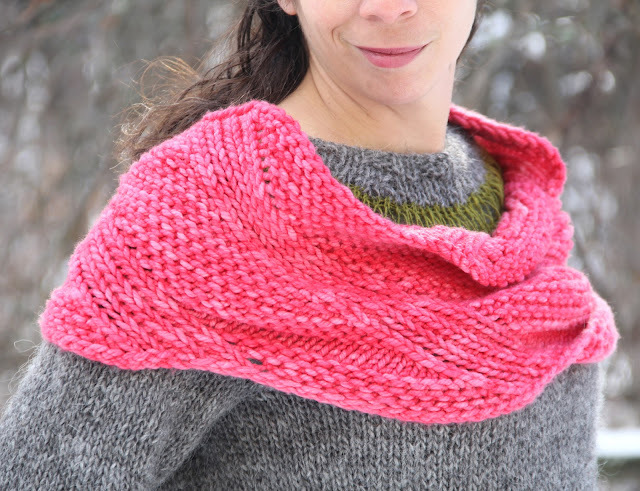 I have searched and searched and cannot find Anzula Bulky at any of the listed online yarn stores. Any ideas? Thanks. Ah, their Burly is a brand new yarn, and not easy to find. Any store that carries their yarn can order it for you, though, that is Anzula's policy! I found it at Jimmy Beans on line. This is such a lovely idea!! Thank you for the inspiration; I have the perfect yarn!! YEAH! Can't wait to see it! Mwah!!! Thankyou! I am sad to let it go, but it is time! I do agree with you - looking for some therapeutic knitting with bright yarn. And taking pleasure in gifting others. But I'm jonesing to start Las Cruces in Noro Taiyo and am having gauge issues. When you have a moment, please check in on your forum on Ravelry and let me know what you'd advise. Many thanks, and I hope we do more than just survive 2017! Hey! I had answered you yesterday... happy to help make your Las Cruces a reality for 2017!!! What a great idea - love it !!!! I love this idea! Sharing the love through knitwear is the best. Wishing everyone a very happy new year! Laura - one more reason thank you: before reading your post on your blog, I was unaware of the Pussyhat Project ( I don't do Facebook). I have been a big supporter of Secretary Clinton ( I actually spent many times more on the campaign than on yarn this year, and if you saw my stash you'd know this is a not insignificant amount!) for years. While I'm not going to Washington, I have a good friend who is going with her daughter-in-law( and my daughter may). I also have some beautiful Jaeger Luxury Tweed in pink. Destiny? I think so! I may have to put other knitting aside a bit, and whip up a few hats. Oh, I'm so happy you read to the end and learned about the PussyHatProject! Thrilled you are joining in! So you are going to the march! I will look out for you there! The cowl is beautiful and I love its mission of spreading happiness and smiles. YES! We scored local bus tickets and decided to do it! See you there! I love your beautiful pink hug! I have 4 pink hats to knit for some going to DC and some going to the rally in Boston. Proud of them all for standing up for love and justice. Love that pink hug! We were hoping that the timing would work out for us to be in the DC area by then, but alas, not quite. We will be with you in spirit! Brava! Putting some positive energy into the world. With best wishes for a happy and healthy new year. Peace on earth and goodwill to ALL! Thrilled I motivated you!!! Can't wait to see your hat! And Happy New year! My dear friend I started reading and smiling...I've finished reading with tears streaming...you are so much MORE than "designer". You are "friend" in the compassionate, insightful, sensitive, inspiring way you know how to be. I will make a pink hug this year and share your love. 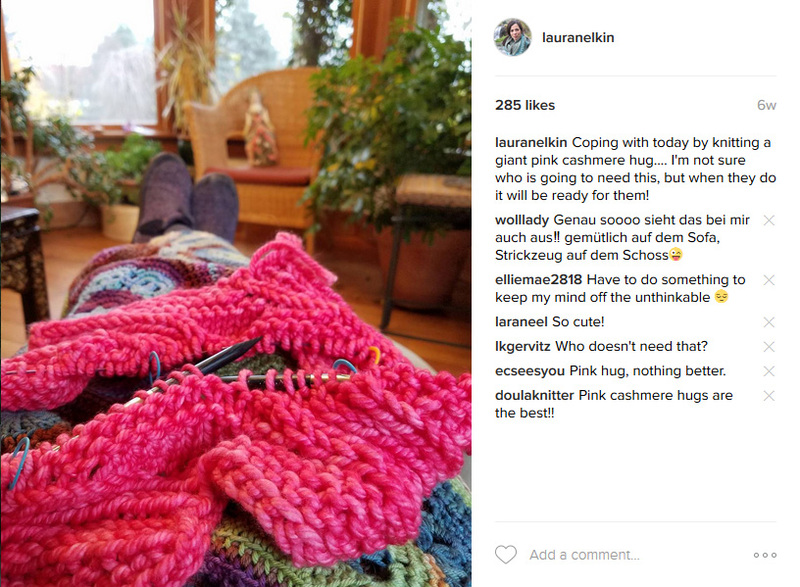 I am a conservative feminist and a relatively new knitter and I love this pink hug. I carry a hundred dollar bill around with me to share at the urging of my inner voice. It always comes back to me somehow to share again. It is truly a beautiful and miraculous thing. I hope your hug travels far and wide. I send you interweb hugs and kisses for your kind heart and great knitting tips. Thank you. A Stopover Mash-Up, Laura Style! Escapado Shawl and Nautical Knitting Recap!! !